For the East Asian liquor, see arrack. The word arak comes from Arabic ʿaraq ﻋﺮﻕ, meaning 'perspiration'. Its pronunciation varies depending on local varieties of Arabic: [ʕaˈraʔ], [ʕaˈraɡ]. Arak is not to be confused with the similarly named liquor, arrack (which in some cases, such as in Indonesia—especially Bali, also goes by the name arak). 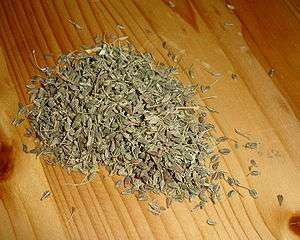 Another similar-sounding word is aragh, which in Armenia, Iran, Azerbaijan and Georgia is the colloquial name of vodka, and not an aniseed-flavored drink. Rakı, mastika, and ouzo are aniseed-flavored alcoholic drinks, related to arak, popular in Turkey, Macedonia and Bulgaria, and Cyprus and Greece, respectively. Arak is usually mixed in proportions of approximately one third arak and two thirds water in a traditional Eastern Mediterranean water vessel called Abarik, Arabic abarīq أبريق; then the mixture is poured into small, ice-filled cups. This dilution causes the clear liquor to turn a translucent milky-white color; this is because anethole, the essential oil of anise, is soluble in alcohol but not in water. This results in an emulsion, whose fine droplets scatter the light and turn the liquid translucent, a phenomenon known as louching. Arak is commonly served with mezza, which may include dozens of small traditional dishes. In general, arak drinkers prefer to consume it this way, rather than alone. It is also consumed with barbecues, along with garlic sauce. If ice is added after pouring it into the cup, this results in the formation of an aesthetically unpleasant layer on the surface of the drink, because the ice causes the oils to solidify. If water is added first, the ethanol causes the fat to emulsify, leading to the characteristic milky color. To avoid the precipitation of the anise (instead of emulsion), drinkers prefer not to reuse an arak-filled glass. In restaurants, when a bottle of arak is ordered, the waiter will usually bring a number of glasses along with it for this reason. Distillation begins with the vineyards, and quality grapevines are the key to making good arak. The vines should be very mature and usually of a golden color. Instead of being irrigated, the vineyards are left to the care of the Mediterranean climate and make use of the natural rain and sun. The grapes, which are harvested in late September and October, are crushed and put in barrels together with the juice (in Arabic el romeli) and left to ferment for three weeks. Occasionally the whole mix is stirred to release the CO2. Numerous stills exist including stainless steel or copper, pot and column stills that will affect the final taste and specificity of the arak. The authentic copper stills with a Moorish shape are the most sought after. The finished product is made during the second distillation. The alcohol collected in the first distillation is distilled again but this time it is mixed with aniseed. 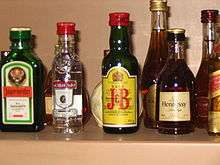 The ratio of alcohol to aniseed may vary and it is one of the major factors in the quality of the final product. Another distillation takes place, usually on the lowest possible temperature. For a quality arak, the finished spirit is aged in clay amphoras to allow the angel's share to evaporate and thus the remaining liquid is the most suitable for consumption. 1 2 Kjeilen, Tore. 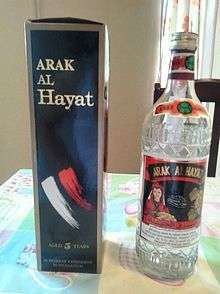 "Arak". LookLex Encyclopaedia. Retrieved 2 December 2012. Arak today is largely a product of Lebanon, Syria and Iraq. 1 2 3 4 5 "Arak: Liquid Fire". The Economist. December 2003. Retrieved 2 December 2012. Syrians, Palestinians, Jordanians and Iraqis [...] have long happily quaffed their own araks. But most would concede that the best of the lot is Lebanese. ↑ Dictionary definition: arak. (n.d.) American Heritage Dictionary of the English Language, Fifth Edition. (2011). Retrieved March 10, 2016. ↑ "Another Anise Spirit Worth Knowing". New York Times. August 2010. Wikimedia Commons has media related to Arak (drink).